This is an excerpt from a longer article on tarot reversals available over on Patreon for patrons at any tier. Reversals in tarot might be one of the trickiest things to teach, not to mention how tricky they can be to learn. But reversals don’t have to be super complicated. Perhaps more importantly, reversals don’t even have to be used! As I shared in a recent Instagram story, there are professional tarot readers who never use reversals, and their readings aren’t diminished one bit. Some decks also refuse to be readable with reversals. Always remember that reversals are not required to read tarot well!! That being said, if you do want to use reversals, there are several different approaches you can take. The one I share below is one of my favorite techniques, but there are loads of other perspectives out there. * In my view, no single approach is the end-all be-all; with practice, deck familiarity, and intuitive development, you’ll be able to ascertain which approach to reversals is applicable in a given context. This is one of my favorite ways to add nuance when using reversals. 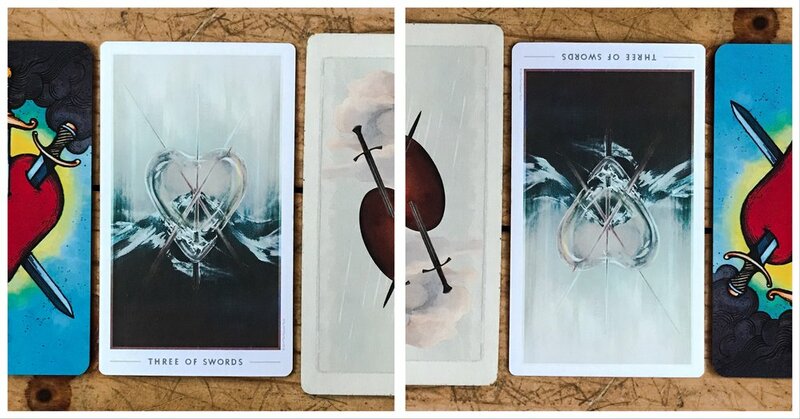 Visual cues are always relevant when reading tarot, and I’m constantly surprised by how often folks believe they need to think their way through reversals when much of the time, the card itself clues you in on how to read it when it’s upside down. On the right, the way the swords enter the heart is a sort of stabbing down, almost as though a heavenly hand has used the heart as a pincushion. But on the left, the sword handles are oriented in such a way that they could be grabbed from below and removed, or perhaps the natural force of gravity itself could slip the swords from the cuts they’ve inflicted. 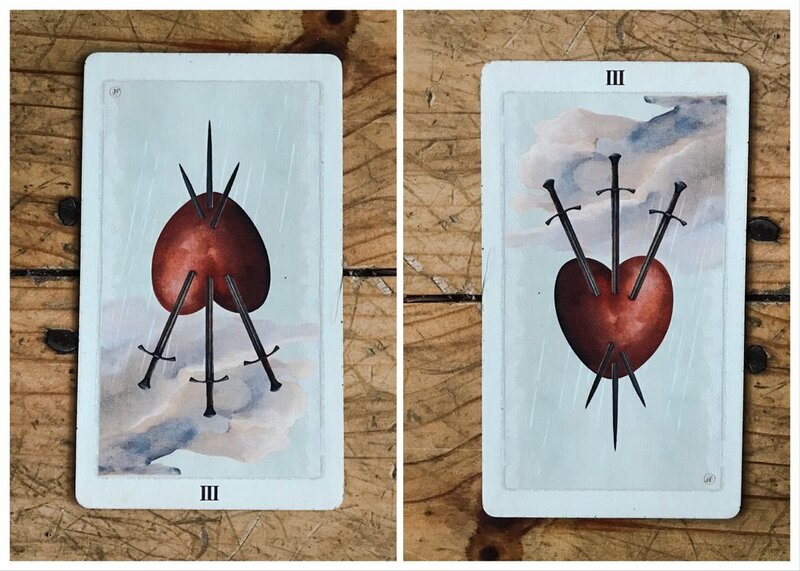 On a visual level, the Three of Swords reversed can speak directly to the fact that heartbreaks are mendable, but that mending requires a literal pulling out of that which caused the harm in the first place. It can also point to a certain personal responsibility: if you don’t pull out the swords and tend to those bleeding wounds, who will? Upright, the swords have been impaled from above (well, a few were probably inserted from behind before the figure ended up face down). Reversed, the swords can fall away or be more easily removed. Of course, one could also see the reversed version as an even more painful variation of upright: balancing on the tips of ten swords sounds like a pretty brutal medieval torture strategy! Pay attention to the miniature story being played out between these cards. Note down any visual observations you might have. I put this together to showcase how cards can feed each other within a spread -- notice that the Star appears to be “pouring out” onto the cards below. In doing so, the Star is watering the seed of the Ace of Pentacles and putting out the burnout fire of the Ace of Wands reversed. Even if the Ace of Pentacles was also reversed, the Star’s waters would still be doing what it can to nourish and rebalance what’s below. How do you read reversals? What do you find challenging? Feel free to drop any questions into the comments below! *to read about three other approaches to reversals that I use in my tarot practice, consider joining me over on Patreon.